Mezzanine work platforms are ideal for adding space to warehouses, manufacturing facilities, shops, hangars, and other areas. Use them for adding pick areas, high-density storage, work and assembly space. Cost effective: Compared to new construction or facility relocation, mezzanines are less expensive and more efficient. Let's explore ways to provide more working space without the hassles of onerous permitting, new real estate, leases or construction delays. Mezzanines also let you use existing climate control, parking, etc. 1" x 1/8" painted steel bar grating in an open design for ventilation and/or fire regulation. Great for applications where easy communication between levels is needed. Not recommended for small parts assembly, as parts can fall through the grating. 20 gauge painted steel roof deck (AKA B-Deck, Corrugated Steel) is an unfinished, lighter duty mezzanine floor panel superior to plywood and other alternatives at a comparable price. Designed for lighter duty pallet jack traffic and foot traffic. A selection of stairs and handrails are available to meet specified code for your area for your structural mezzanine project. 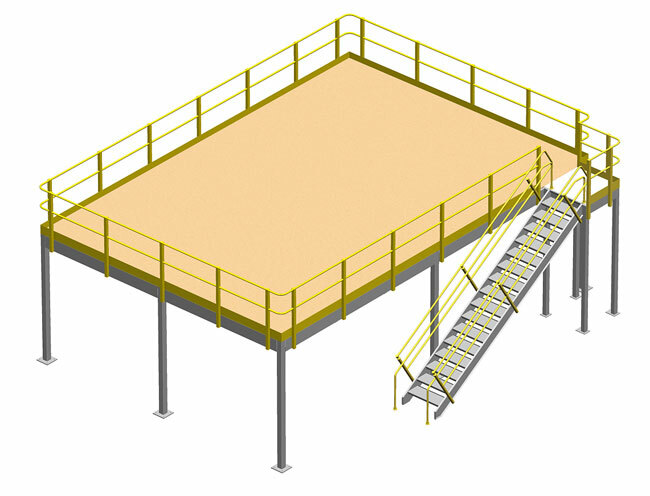 Mezzanines are rated for specific seismic code regulations. Verification by qualified engineers is required subject to local building codes. Contact us for assistance. For many applications, standard sizes won't work. These mezzanines and prices are designed to help you budget what a mezzanine that size may cost. We'll help you sort out the details and get the best possible mezzanine at the best possible price. Submit a configuration request for fast help. Mezzanines give you added space at a moderate cost, with superior quality throughout. High strength, zinc plated steel bolts combine with heavy duty steel angles to align the framing for uniform installation. These integrated components lock the connection into a solid unit for maximum strength. The mezzanines listed are Beam & Beam style construction. They provide tremendous strength and load bearing capacity, with low composite heights available. See Beam & Beam Construction details for more information. Heavy duty columns provide strength and loading capacity required for industrial and commercial applications. Completely fabricated steel components require no drilling, cutting or welding. A selection of stairs and handrails are available to meet specified code. Mezzanines meet the specifications for structural steel construction set by the American Institute of Steel Construction (AISC). In addition, all materials conform to the standards set by the American Society of Testing Materials (ASTM). All systems meet specified national, state and local codes. Factory installers can often erect the mezzanine without interrupting normal work schedules. Or it can be installed by your own personnel. To aid in installation, component parts are piece marked with cross references to an installation manual complete with drawings. We offer a limited range of options on the website. However, many configurations and options are available, and we can help you specify them easily and quickly. For assistance, call customer service or submit a submit a mezzanine inquiry.